It will be a day that's remembered for years to come in Ireland, 12 October 2014. 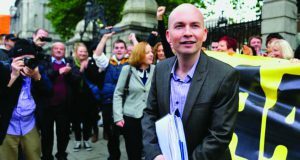 An estimated 100,000 marched in Dublin against the hated Water Charges and Paul Murphy, Anti Austerity Alliance (AAA) candidate, won a By-Election by leading the call for a mass campaign of non-payment and active resistance to this double tax. 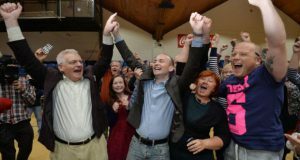 Socialist Party wins a second TD and Anti Austerity Alliance 14 councillors. 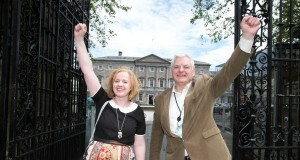 The government hope that the signs of economic recovery will signal a recovery in the polls for Labour and Fine Gael. But the reality is, any recovery will not mean an easing of austerity. Indeed austerity is here to stay, and the Anti Austerity Alliance is here to resist it. These elections come at an important time. Every time we turn on the TV or read the papers we will see the government and many of their friends in the right wing press trumpeting a “recovery” in the economy. However, where is the recovery for working people who are suffering under viscous neo-liberal austerity policies? 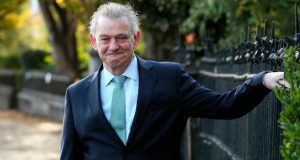 Emigration is at record levels, our public services are at breaking point, despite the smoke and mirrors from the Labour Party social welfare is being slashed, there is a housing crisis with soaring rents and house prices, unemployment is high and the only jobs available are low paid with yellow pack conditions. Even as the votes in the Fiscal/Austerity Treaty Referendum were being counted, attention was already moving to the immediate and medium term future of the Eurozone and the fate of the millions of people in its economically beleaguered periphery. History may well show that the treaty itself was an almost irrelevant distraction from an honest appraisal of the cataclysmic problems that bedevil the currency union as all the contradictions in its economic and financial systems assert themselves with a vengeance.